Bus tickets from Glasgow (Scotland) to Manchester (England) can be provided by National Express, Megabus. We suggest you have a look at the luggage policies and services on board of each company before buying your ticket. The cheapest price found to travel in the next month for your coach is £10.20. This price, based on a standard ticket without a coachcard, may vary depending when you want to travel and how much time in advance you book your journey to Manchester from Glasgow. 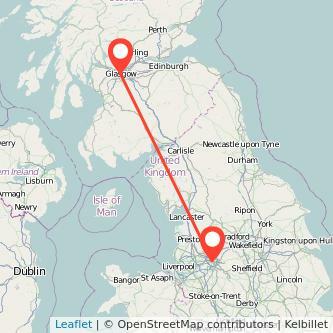 You will need on average 4h34m to take the bus from Glasgow to Manchester which are 184 miles away from one another. While coach services are often slower than trains or flights, they are almost always the cheapest solution for your journey. Find the cheapest tickets to travel from Glasgow to Manchester by coach, train, carsharing and flights. Looking at our data, 6 services are being operated today and 5 tomorrow. The first bus Glasgow to Manchester departs at 08:20. The last one leaves at 23:59. Bus operators can adjust the first and last departure hours depending on the day of the week and if you're travelling during school holidays, bank holidays or for a popular event. The price of a ticket for a coach from Glasgow to Manchester is cheaper the further you book in advance. The table above helps you understand the evolution of the price depending how much time in advance you book your coach. It is based on the best fares found in the past 6 months. With fares available from £8, we recommend you to buy your bus 1 month in advance. It can cost you on average 55% less than if you book on the day you're travelling which should cost you around £18. By booking in advance, you will also make sure that tickets remain available for your trip. Gopili compares prices to help you find cheap bus tickets from Glasgow to Manchester for the coming days. You can also have a look at the prices for the Manchester Glasgow bus to make sure you get a seat for your return journey.